VDNKh is in the top 10 of the most instagrammed locations worldwide in 2016. Why? On 1st of December Instagram published a list of the most popular travel hashtags and geotags of 2016. In the list of the world's most geotagged cities of 2016 Russia is mentioned twice: Moscow is in the third place right after New York and London, while St. Petersburg, Russia’s cultural capital, is in seventh. We also find Russia in the list of most instagrammed locations of 2016, and it is not St Basil’s Cathedral or Red Square, but the VDNKh exhibition center and amusement park. Why is it so popular worldwide? More than eighty years ago, Moscow saw the birth of the VDNKh project, the most grandiose exhibition park in the Soviet Union and a showcase of the country's economic achievements. The site’s former glory — with its eclectic mix of monumental Stalinist architecture and full range of historical styles from Gothic to Art Nouveau — still wows visitors to this day. 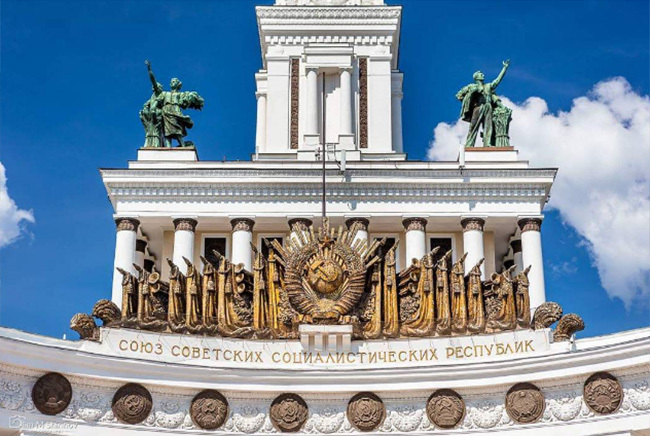 Now it is a Soviet Era theme park that attracts tourists as well as locals wanting to admire Soviet architecture and national crafts and to take a look at the fountains encircled by golden statues. Inside the pavilions you can buy goods from all across Russia, visit exhibitions about Russian history or art, and go horse riding. In summer bring your roller blades, while in winter you can go skating on the largest artificial ice rink in the world. Want to know more about VDNKh? Check out our long read about its history, architecture, myths, and legends.